The community Rottach-Egern previously mentioned for the first time with Adalprecht de Rota, both belonged to the monastery Tegernsee, founded 746 under Abbot Eberhardt. Rottach-Egern was a fishing and farming village and received its impetus mainly by the Benedictine monastery Tegernsee, which existed until the secularization in 1803 and was famous for its library. Duke Heinrich of Tyrol opened in 1320 the way through Achental (Tyrol), thereby Rottach was included in the road that was an important trade route from Bavaria to Austria and Italy. Since that time until the 19th century the place was essentially a transit and relay station. After the monastery abolition in 1803 the Wittelsbacher family came in 1817 at the Tegernsee and with them the first guests. There were ministers and state secretaries, poets and painters, and especially the nobility. The Egener cemetery is one of the most visited cemeteries in Old Bavaria. 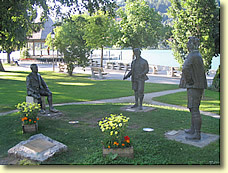 The poet Ludwig Thoma and Ludwig Ganghofer, the Kammersänger Leo Slezak (whose sculptures are in the Rottacher lake prommenade ), the writers Heinrich and Alexander Spoerl and the famous painter Olaf Gulbransson are buried here. Rottach-Egern is today with around 6800 inhabitants, the largest community banks at the lake Tegernsee and in 1976 recognized as a health resort. They can accommodate 3200 guests. The municipal area of ​​Rottach-Egern comprises approximately 60 square kilometers and is 740-1700 meters above sea level. 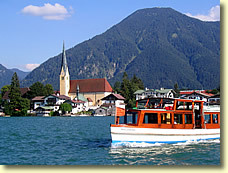 The Tegernsee is 6 km long, 2 km wide and 72 meters deep at its deepest point. Today's guest house was built in 1902 and led as Gasthof Hahn. 1906 acquired Johann and Elise Pfatischer buy over and run the guesthouse with its own butcher shop, beer garden and rooms for rent in Bavarian style. Ludwig Pfatischer the trained butcher and his wife Katharina took over the family business very early. First, the Fremdenheim Pfatischer was a rest home of the mining workers and Kurheim for the german company Siemens to increasingly tourism gained importance. The house was repeatedly upgraded or expanded, modernized and extended. 1967 rendered Ludwig and Katherina Pfatischer pioneering work on the construction of the first indoor swimming pool far beyond the counrty area. 1990 was followed by the expansion of the spa area with sauna, steam bath, fitness, through the Son Bernd Pfatischer. Since 1999, now sets Bernd and Rosi Pfatischer with Christina and Tobias the long-standing family tradition. The end of 2010, the new building of the holiday home “Landhaus” was finished in rustic style in the garden. There are guests apartments of various sizes available.